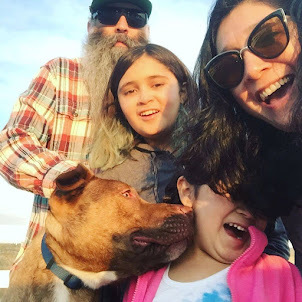 Punk Rock Parents: Trying new things. PR Dad and I are into trying new things. Experimenting if you will. I mean you never know what you are going to like. This is especially true for us with food and drink. I mean I tried a drink called the Salty Dog once. So while hanging out with some friends we got onto the subject of wine tasting which lead to our friend Luka talking about Lambic. I was intrigued because he said that it was really delicious. Lambic is a basically a fruit flavored beer that is mostly from Belgium. 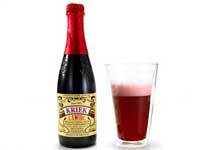 So while on a recent trip to BevMo we purchased a small bottle of Kriek (black cherry). We split it the other night and OMG I loved it. I can't believe that I had never heard of or tasted this before. After doing some research (mine on the internet and PR Dad by asking actual live people. He is old school like that) We found that lambic can be found at most liquor stores. Even Sam Adams made a cranberry one. If you have never heard of Lambic I suggest trying one asap. Now every night, after dinner I sigh and say "Man I wish I had some lambic right now". That stuff is great. I call it champagne beer. there is always a pumpkin beer during thanksgiving at albertsons. i always want to try it, but never do. YUM! I've never had it but we have a local ice cream place that makes their own ice cream and they have a cherry lambic ice cream - YUM!